Personal space is not a physical thing, but rather psychological. As humans we have a “space bubble” that represents what we feel comfortable with in terms of the space between ourselves and others. 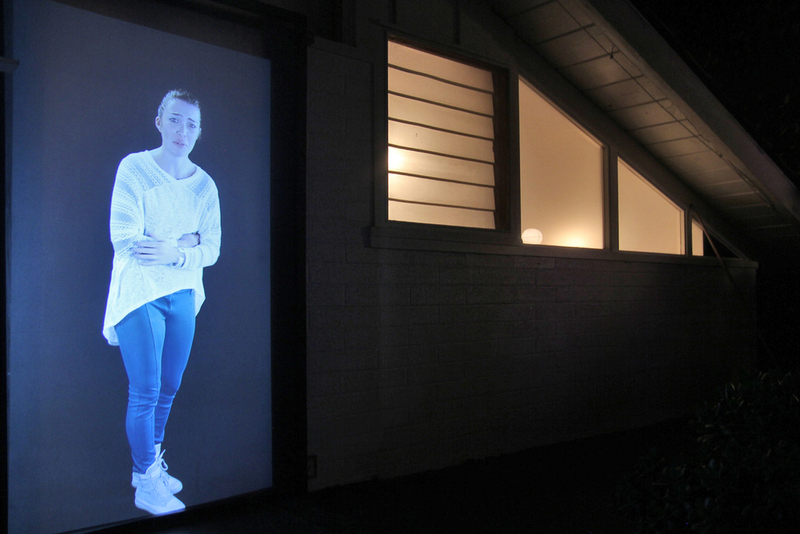 This installation is an interactive experience that integrates video and physical computing elements to create a real-time dynamic interaction between a human and a “digital surrogate”, or a digital representation of a human. As the viewer approaches the surrogate, they begin to elicit negative responses such as annoyance, anger, and eventually a fight or flight response if the surrogate’s final boundary, representing intimate space, is violated. The installation is a synthetic experience designed to exploit our credulity and to put the viewer in an awkward and psychologically charged situation. Each individual’s engagement behavior is recorded in order to see how the audience chooses to react to the simulated emotions their presence elicits from the digital surrogate. If the simulation seemed to be distressed or upset, do we not still feel burdened by those emotions that we have evoked? The installation is in it’s nature a question. Do we respect the simulation’s wishes for privacy?